For the body, mind and spirit. 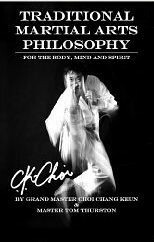 Our goal in writing this book was to present the elements of good character from a martial arts perspective in a way that offers a blueprint for positive living that can be adopted by all people. available now at Amazon.com and later through most retail book stores. and then type in "traditional martial arts philosophy"
under the section called LEAVE A REVIEW.